WARNING: Accidental overdose of iron-containing products is a leading cause of fatal poisoning in children under 6. Keep this product out of the reach of children. In case of accidental overdose, call a doctor or a Poison Control Center immediately. 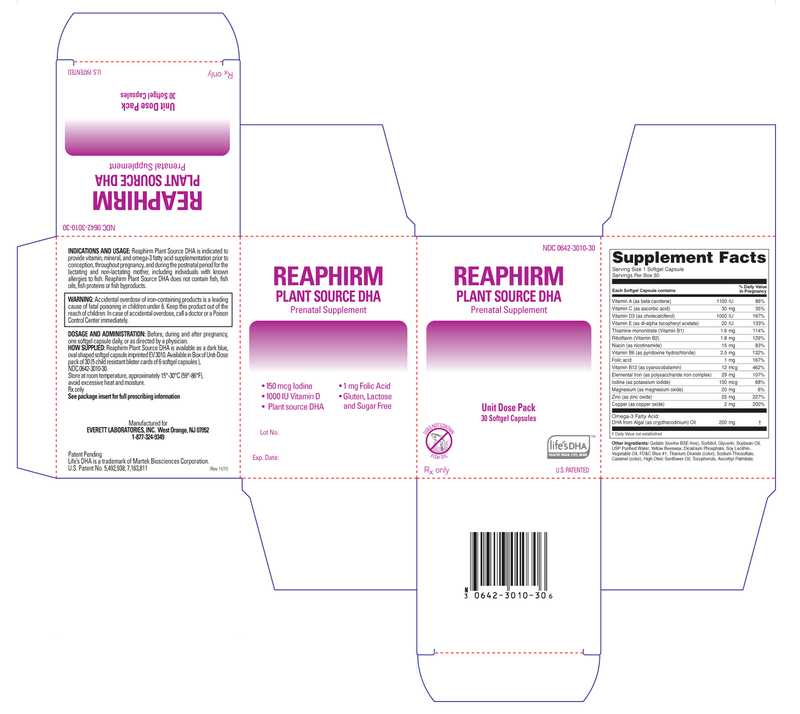 Reaphirm Plant Source DHA is contraindicated in patients with hypersensitivity to any of its components or color additives. Folic acid is contraindicated in patients with untreated and uncomplicated pernicious anemia, and in those with anaphylactic sensitivity to folic acid. Iron Therapy is contraindicated in patients with hemochromatosis and patients with iron storage disease or the potential for iron storage disease due to chronic hemolytic anemia (e.g., inherited anomalies of hemoglobin structure or synthesis and/or red cell enzyme deficiencies, etc. ), pyridoxine responsive anemia, or cirrhosis of the liver. Cyanocobalamin is contraindicated in patients with sensitivity to cobalt or to cyanocobalamin (Vitamin B12). Reaphirm Plant Source DHA should be used with caution in patients with known sensitivity or allergy to soy. Vitamin D supplementation should be used with caution in those with hypercalcemia or conditions that may lead to hypercalcemia such as hyperparathyroidism and those who form calcium-containing kigney stones. High doses of vitamin D can lead to elevated levels of calcium that reside in the blood and soft tissues. Bone pain, high blood pressure, formation of kidney stones, renal failure, and increased risk of heart disease can occur. Iodine should be used with caution in patients with an overactive thyroid. Prolonged use of iron salts may produce iron storage disease. Folic acid, especially in doses above 0.1 mg daily, may obscure pernicious anemia, in that hematologic remission may occur while neurological manifestations remain progressive. The use of folic acid doses above 1 mg daily may precipitate or exacerbate the neurological damage of vitamin B12 deficiency. Consumption of more than 3 grams of omega-3 fatty acids per day from all sources may lead to excessive bleeding. Supplemental intake of omega-3 fatty acids such as DHA exceeding 2 grams per day is not recommended. Avoid Overdosage. Keep out of the reach of children. Medications for an overactive thyroid (anti-thyroid drugs) used in conjunction with iodine supplementation may lead to hypothyroidism. Medications for hypertension used in conjunction with iodine supplementation may increase potassium. High doses of folic acid may result in decreased serum levels of the anticonvulsant drugs. Vitamin D supplementation should not be given with large amounts of calcium in those with hypercalcemia or conditions that may lead to hypercalcemia such as hyperparathyroidism and those who form calcium-containing kidney stones. Zinc can inhibit the absorption of certain antibiotics; take at least 2 hours apart to minimize interactions. Information for Patients: Patients should be counseled to disclose all medical conditions, including use of all medications, vitamins and supplements, pregnancy, and breast-feeding. Pediatric Use: Not for pediatric use. Adverse reactions have been reported with specific vitamins and minerals, but generally at doses substantially higher than those in Reaphirm Plant Source DHA. Reported adverse events include skin ailments, gastrointestinal complaints, glucose abnormalities, and visual problems. Before, during and after pregnancy, one softgel capsule daily, or as directed by a physician. Reaphirm Plant Source DHA is available as a dark blue, oval shaped softgel capsule imprinted "EV3010". Available in Box of Unit-Dose pack of 30 (5 child resistant blister cards of 6 softgel capsules). Store at room temperature, approximately 15-30C (59-86F), avoid excessive heat.